Elsa was given away by a male family member who never had my permission to do so. I was told he took Elsa to Fulton Humane Society and outside was a lady who he approached and she said she would take Elsa to live on her farm. 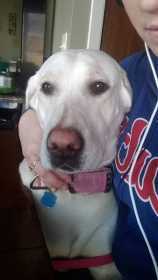 I have Elsa posted on all lost dogs sites, text messages sent to local shelters. Please if anyone has her or has seen Elsa call me anytime at 630-329-1286. Elsa was not in a familiar area just in case this person's story is a lie and he let her loose.